During the peak summer months, families are looking for fun places to cool off. Happily, water parks across New England the rest of the Northeast keep introducing new attractions with bigger splashes, more thrilling drops, and crazier raft rides. Connecticut has two outstanding water parks, in Bristol and Middlebury. Lake Compounce, Bristol: Connecticut's largest water park is part of the Lake Compounce amusement park in Bristol. Though not huge by national standards, it still packs in a lot of fun, including such highlights as the Croc-O-Nile lazy river, Bayou Bay wave pool, and Tunnel Twisters water slides. Quassy Amusement Park and Waterpark, Middlebury: The water park here, Splash Away Bay, features water slides and a lot of interactive elements, including a tipping bucket, sprayers, water cannons, and other gizmos. Swimming is allowed in Lake Quassapaug and, for an additional fee, you can rent paddle boats or take a lake cruise on the Quassy Queen. If you're looking for water parks in Maine, check out these two in Saco and Trenton. Funtown Splashtown USA, Saco: Next door to Funtown, its sister amusement park in Saco, Splashtown offers plenty of wet rides to keep big kids and teens happy. The biggest thrills come from twin drop slides (Triton's Twist and Poseidon Plunge), dark tube ride (Splish), and classic water funnel (Tornado). Wild Acadia Fun Park & Water Slides, Trenton: In eastern Maine near Acadia National Park, this is the only water park around. It includes a pool and two twisting slides for kids at least 45 inches tall. The best Massachusetts water park is at Six Flags in Agawam. Six Flags New England Hurricane Harbor, Agawam: From large pools and lazy rivers to multi-passenger rafting rides and speed slides, you'll find rides and experiences for everyone in the family. Highlights include the Bonzai Pipelines and Cannonball Falls. 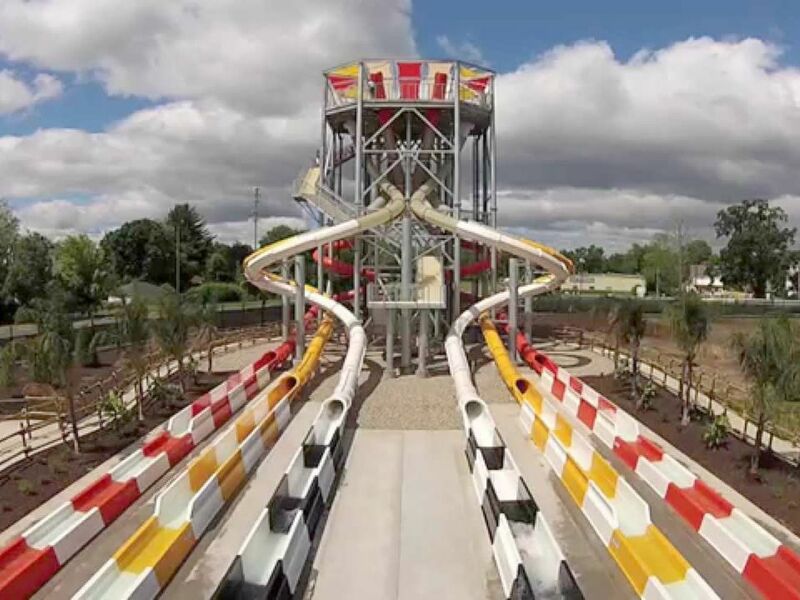 New Hampshire touts one outstanding water park among several. Water Country Water Park, Portsmouth: This good-sized park offers plenty of fun for all ages, from exciting rides for teens and older kids to tamer slides for younger children. On the thrill-ride end of the spectrum, there are the Dragon's Den bowl ride, the Black Hole, and Warp 8 enclosed body slides​ and Double Geronimo speed slides. There are also a quarter-mile-long lazy river and plenty of mat rides and tube and body slides. New Jersey's water parks include one of the best in the region, at Morey's Piers. Raging Waters Water Park, The Wildwoods: Inside this shipwreck-inspired water park at Morey's Piers, families can slip and slide on exhilarating rides such as the River Adventure and Shotgun Falls, as well as the 175,000-gallon interactive activity pool and two interactive kiddie play areas. As with all things, New York offers some of the greatest water parks in the Northeast. Enchanted Forest Water Safari, Old Forge: Located in the Adirondacks, the largest water park in New York state offers more than 50 rides and attractions, including 32 wild water rides such as Serengeti Surf Hill and speedy Killermanjaro, one of the tallest slides in the park. Zoom Flume, East Durham: In the Catskill Mountains a few hours north of New York City, this water park offers the Typhoon Twister bowl slide, numerous winding water slides, the Wild River raft ride, a lazy river, wave pool, and a good-size activity pool. There's also a water zip line, smaller slides for younger kids, and a splash area for little ones. Splish Splash Waterpark, Calverton: This 96-acre Long Island water park offers wave pools, speed slides, lazy river, family raft rides, and tube slides. Small children can head over to the Octopus Pool, slide down the Elephant Slide, and play with water cannons, climbing ropes, and slides at the Monsoon Lagoon and Pirates Cove. Pennsylvania's best water parks are in Hershey and Tannersville. The Boardwalk at Hersheypark, Hershey: Admission to Hershey's Boardwalk water park is included with admission to Hersheypark. The Boardwalk reprises the style of the classic seaside boardwalks of the Northeast and offers 15 water rides. Camelbeach Mountain Water Park, Tannersville: Pennsylvania’s largest water park has 37 rides, slides, and other attractions, including the Blue Nile River Adventure lazy river and Kahuna Lagoon wave pool. Vermont's water parks include on that's indoors for year-round fun. Jay Peak Pump House Indoor Water Park, Jay: The Pump House has a 65-foot water chute; a double-barrel flowrider that's a cross between, surfing, skateboarding, and snowboarding; Big River for relaxing; a kids' play area; and indoor and outdoor hot tubs.